450 pages | 68 Color Illus. Introductory Criminology: The Study of Risky Situations takes a unique and intuitive approach to teaching and learning criminology. 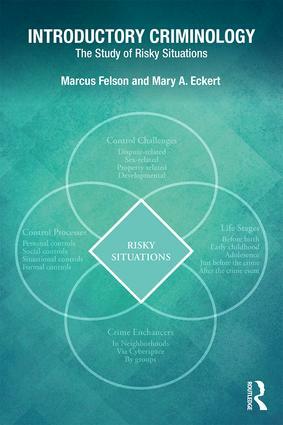 Avoiding the fragmentation of ideas commonly found in criminology textbooks, Marcus Felson and Mary A. Eckert develop a more practical, readable structure that engages the reader and enhances their understanding of the material. Their descriptive categories, simultaneously broad and realistic, serve better than the usual philosophical categories, such as "positivism" and "classicalism," to stimulate students’ interest and critical thinking. Short chapters, each broken into 5–7 sections, describe situations in which crime is most likely to happen, and explain why they are risky and what society can and can’t do about crime. They create a framework to organize ideas and facts, and then link these categories to the leading theories developed by criminologists over the last 100 years. With this narrative to guide them, students remember the material beyond the final exam. This fresh new text was created by two professors to address the main points they encounter in teaching their own criminology courses. Problems solved include: reluctant readers, aversion to abstract thinking, fear of theory, and boredom with laundry lists of disconnected ideas. Felson, a leader in criminology theory with a global reputation for innovative thinking, and Eckert, an experienced criminal justice researcher, are uniquely qualified to reframe criminology in a unified arc. By design, they offer abstractions that are useful and not overbearing; their prose is readable, and their concepts are easy to comprehend and remember. This new textbook challenges instructors to re-engage with theory and present the essence of criminological thought for adult learners, coaching students to grasp the concept before any label is attached and allowing them to emerge with deeper understanding of what each theory means and offers. Lean, with no filler or fluff like stock photos, Introductory Criminology includes the authors’ graphics to crystallize and expand concepts from the text. Do police reduce crime, or merely displace it? A whole new image of "high crime zones"
Marcus Felson is the originator of the routine activity approach and author of Crime and Everyday Life. He has also authored Crime and Nature, and he serves as a professor at Texas State University in San Marcos, Texas. He has a B.A. from the University of Chicago and an M.A. and Ph.D. from the University of Michigan. He has received the 2014 Honoris Causa from the Universidad Miguel Hernandez in Spain, and he has been given the Ronald Clarke Award by the Environmental Criminology and Crime Analysis group and the Paul Tappan Award by the Western Society of Criminology. He has been a guest lecturer in Argentina, Australia, Belgium, Brazil, Canada, Chile, China, Denmark, El Salvador, England, Finland, France, Germany, Hong Kong, Hungary, Italy, Japan, Mexico, the Netherlands, New Zealand, Norway, Poland, Scotland, South Africa, Spain, Sweden, and Switzerland. He has applied routine activity thinking to many topics, including theft, violence, sexual abuse, white-collar crime, and corruption. Two books honoring Professor Felson’s work have been published, one in English and another in Spanish. Mary A. Eckert has devoted an active career to applied research in criminal justice and program evaluation. She has an M.A. and Ph.D. from New York University. Her B.A. is from the College of New Rochelle. Dr. Eckert served as Research Director of the New York City Criminal Justice Agency, Inc., where she authored many research reports and guided that agency’s diverse research agenda, including work on pretrial risk assessment, court case processing, and evaluation of alternative-to-incarceration programs. She then served in the New Jersey Office of the Attorney General, with a special focus on statistical evaluation of vehicle stops to assist the New Jersey State Police in reducing the potential for racial profiling. Her work has been recognized by the New York Association of Pretrial Service Agencies and the State of New Jersey. She has also served as an adjunct professor at New York University, Montclair State University, and Texas State University. Marcus Felson’s wife and life partner, this book is her second collaboration with her husband.